Just wondered if anyone has tried to secure the login page of ZM, with a captcha or some anti brute forcing method? I think fail2ban can be used, it can be used to prevent brute force attacks for anything that posts log messages at failed login (the log does however need to contain the IP address, not sure if zoneminder writes it to the log). I would have another question though - where does zoneminder logs failed access attempts? I mean application logons of course - when you set up passwords in the app. Last edited by darmach on Sat Oct 29, 2016 8:51 am, edited 1 time in total. I'm trying Fail2ban myself, but I also set up ufw, the default firewall. I don't have my server in the wild yet, but later today I should know how well it works. Did you get ZM upgraded to 1.28.1 like I suggested in the other post? darmach wrote: I would have another question though - where does zoneminder logs failed access attempts? I mean application logons of course - when you set up passwords in the app. 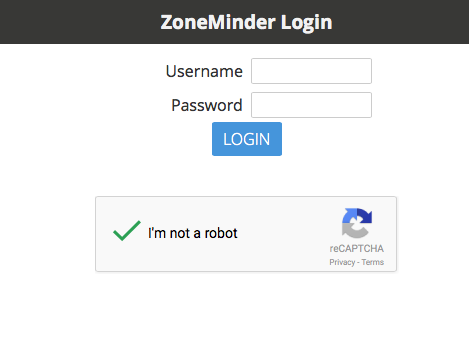 I assumed zoneminder did log login failures, but it seems to only log successful logins. That was a disappointment to me. I never had the need to secure it beyond what was already available. I just added HTTPS. But given this thread, I gave it a go - it was pretty trivial to add re-Captcha for instance. Modify login.php to insert the div and edit actions.php to handle the POST callback check of re-captcha. Anyone wanting to use mobile clients (such as zmNinja or zmView) should not do this -- their clients will fail to log in. Last edited by asker on Tue Aug 18, 2015 7:25 pm, edited 1 time in total. I don't believe you. I think you are a robot. A pity it will be a moment till it is available in debian repos. Anyway - thank you v much! No need to wait if you don't want to. It is just a few lines of php. You could edit the file functions.php on your system to match. Until this is included in the zoneminder package you are using, you will have to reapply this patch after a package upgrade. I think the captcha on login page is a great feature... just needs to be turned on/off in config. So we can just edit the functions.php with that code, then add the actual captcha code to the login page/actions.php? That is awesome that you have managed to get this put in so quick! Zmjm15 wrote: So we can just edit the functions.php with that code, then add the actual captcha code to the login page/actions.php? No, we are conflating two completely different features. 2. What I added was a google re-captcha which adds further bot checks in addition to ZM's own auth. ZM needs people to contribute. ZM is an awesome product - you'd be surprised to know only 3-4 people work really hard to maintain it without any expectations of getting anything back except satisfaction (I'm not in that count) so I'd encourage you to experiment and try to implement this feature. I'm not a PHP person at all, so if you are not comfortable with it, don't worry, its not hard to pick up. And if you are already aware of it, then I'd love for you to add this. If you do add it, I can promise you, I can add the code to the web interface that allows users to enable/disable it and put in their secret key.